Does this look like meat to you? Pulled pork, maybe? 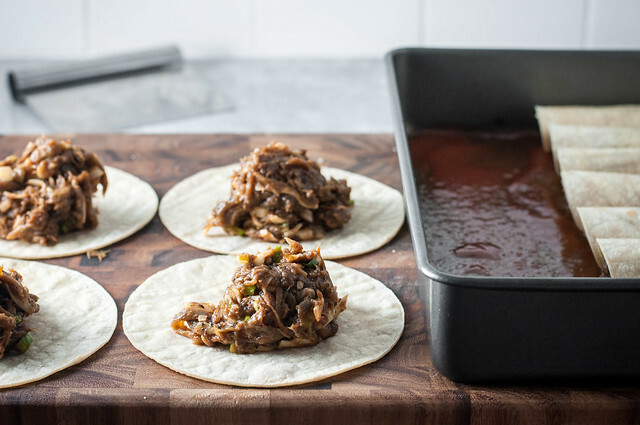 What about these little soon-to-be-enchilada piles of BBQ goodness? If you think so, then you’re both right and wrong. 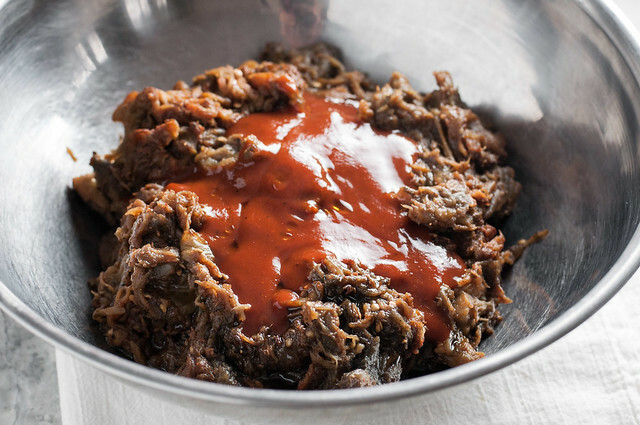 I think you’d be hard-pressed to say it doesn’t look a little meaty, but in reality it’s “just” genius pulled eggplant cooked low and slow in BBQ spice rub then tossed in a final coating of your favorite BBQ sauce. Even though it would have been phenomenal piled onto a slider bun and topped with some cheese and onions, I didn’t stop there. 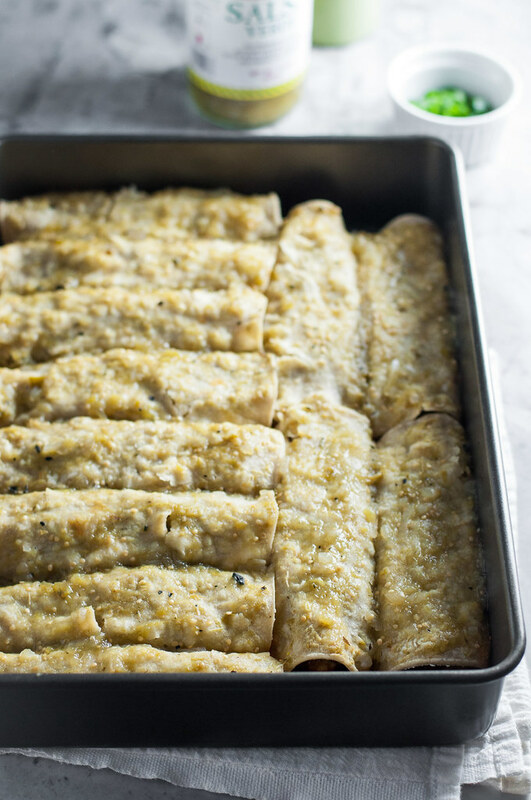 No, instead, I stuffed it into enchiladas for one of my favorite Tex-Mex recipes to date: meatless BBQ enchiladas. As a near-vegetarian, the meat I miss/cheat for the most is pork, usually in bacon or BBQ format. During a random recipe brainstorm session about a year ago, the look of my Thai eggplant salad prompted me to jot down the idea for pulled BBQ eggplant. It seemed like it could work really well with eggplant’s fibrous, juicy texture, but recipe development got put on hold in the midst of wedding planning. Once all the commotion of getting married, moving, a brand new puppy, and family Christmas in Oklahoma was settling down, I got an email from Duluth Grill, of Diners, Drive-ins, and Dive’s fame, and whom I visited on my last trip to northern Minnesota. I published a gluten free spin on their ridiculously easy and creamy mac and cheese recipe in the early days of NCK, and they wanted to know if I’d be interested in a complimentary copy of volume two of the restaurant’s cookbook. Yes, yes, and YESSSSSS!!!! To top off the perfect mix of classic and adventurous comfort food recipes in the book, I knew it was fate that the final pages included a recipe for BBQ eggplant. So maybe my procrastination in developing that wish list recipe was meant to be, because there’s no way my invention could top the pulled eggplant that this recipe yields. Unlike meat, eggplant is primed to take on all the flavor in a dry BBQ rub after it’s been roasted once. Then, after it marinates overnight in the rub, I just popped the lid off of my pan and into a low oven it went. Low heat bakes in all that BBQ flavor and dries out super moist eggplant just enough that it stops looking like eggplant and transforms into delicious BBQ, regardless of the lack of meat content. In the end, I can’t resist good veggie enchiladas, especially when they’re merged with all-American BBQ flavors. It’s simple, fun, and surprising, and I think you’ll find it to please omnivores and vegetarians alike, plus most generally healthy eaters. The cheese in these enchiladas is mixed into the filling, and you don’t need much alongside that juicy BBQ. So tell the men and kids it’s cheesy BBQ, and make sure the health nuts (i.e., me) know that it’s gluten free, light on the cheese, and even vegan if you leave the cheese out. Everyone’s happy! Looking for more meaty and meatless midwest-inspired comfort food? Good news! 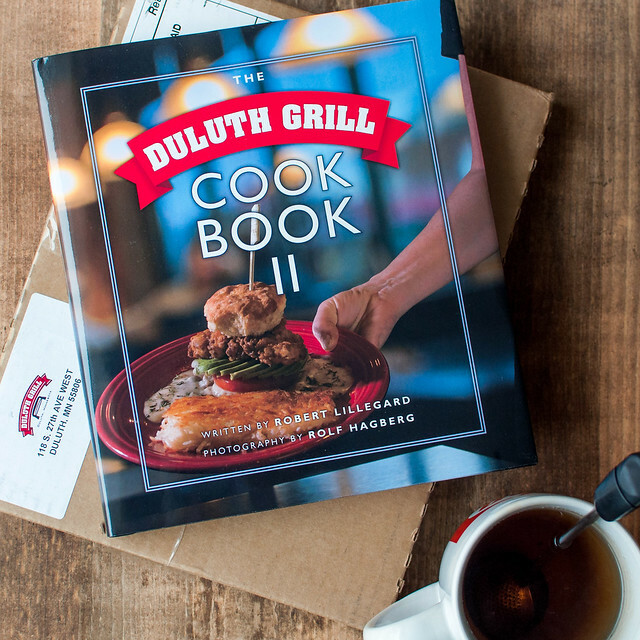 Even if you don’t live within reasonable proximity to Duluth, you can buy the cookbooks online (and at some local stores in Minnesota). The first book (my first love) is available on Amazon and here, directly from the restaurant. Check out my review and adaptation of the mac and cheese in this post. The new second book is available online exclusively via the restaurant’s website. 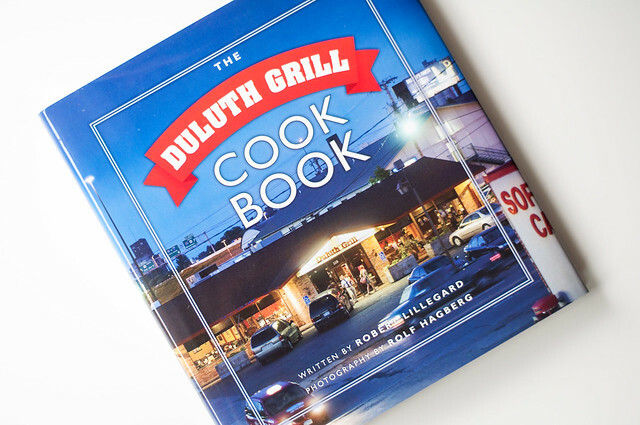 A big thanks to the friendly people at Duluth Grill for sending me an advance copy of the cookbook! All opinions in this post are my own, and no further consideration was provided besides the amazing book. Vegetarian and gluten free. Easily vegan/dairy free with cheese omitted. Combine first nine ingredients for the BBQ eggplant to make the spice rub mix. Set aside. Preheat broiler and set oven rack about 10 inches from heat. Pierce each eggplant in 8 places with a paring knife and place them on a large rimmed baking sheet. Broil 25 to 35 minutes until blackened, heavy, and very tender, turning 3 to 4 times throughout cooking. When slightly cooled, cut off the top of each eggplant then halve lengthwise to cool a bit more. Use tongs or a fork to pull eggplant flesh into strips, transferring to a colander set over a bowl. 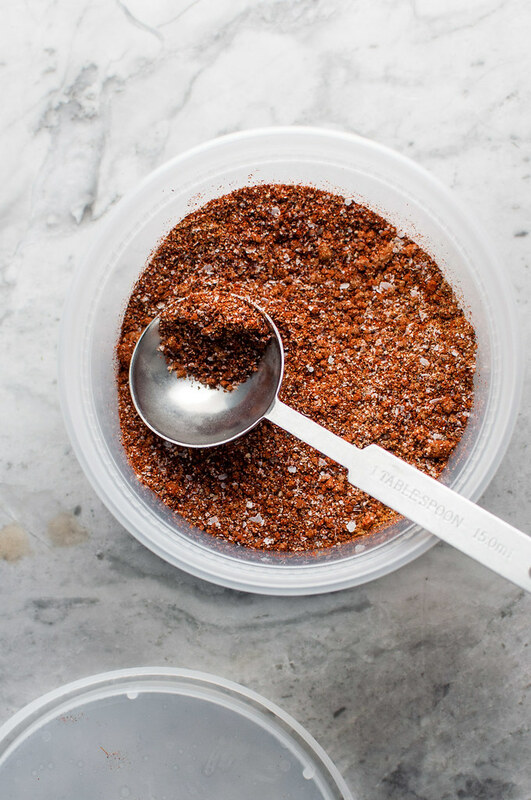 To remove conspicuous seeds without losing "meat", scrape seeds away with the sharp edge of a paring knife. After most liquid has drained from eggplant, transfer the "meat" to a 9 by 13 inch pan and sprinkle with half the spice rub. Toss to coat, then, if time permits, refrigerate overnight. 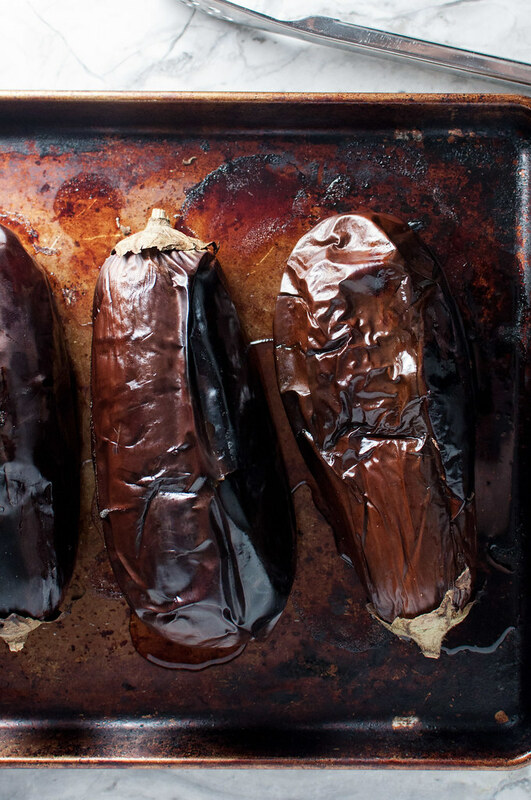 When ready to bake, preheat oven to 250 (F) and toss eggplant with remaining spice rub. Bake, uncovered, for 1½ hours, stirring a couple times. Increase oven temp to 350 and bake 15 to 30 minutes more, until little to no moisture remains in the bottom of the pan. Cool in the pan at least 15 minutes, then add BBQ sauce and sesame oil and stir to coat, adjusting seasoning with more salt and pepper as needed. Preheat oven to 375. 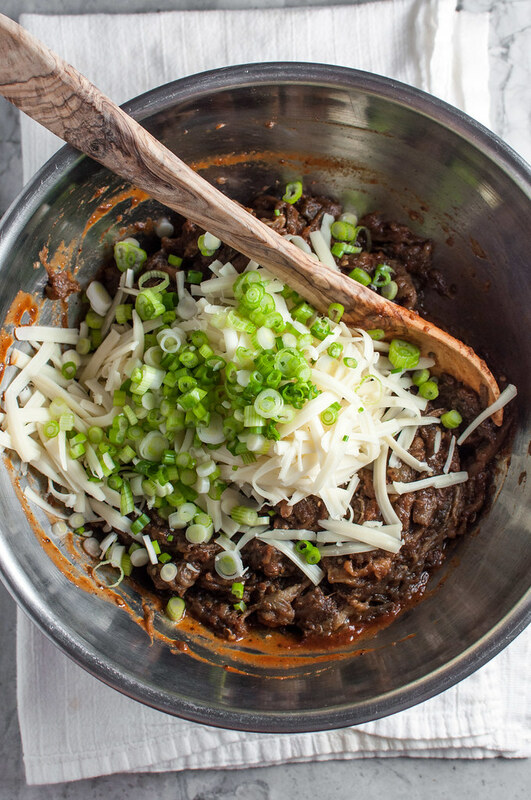 Transfer BBQ "meat" to a mixing bowl and combine with scallions and cheese. Lightly oil or spray the (cleaned) 9 x 13 pan and spread the BBQ sauce on the bottom. Place each tortilla on a plate or cutting board and scoop ⅓ cup filling onto it. Roll shut and place seam side down in the prepared pan. Repeat until the pan is full of enchiladas (you may have some leftover filling, which is great for quesadillas). Spoon tomatillo salsa over the enchiladas. Bake, uncovered, for 25 to 30 minutes, until hot and bubbly. 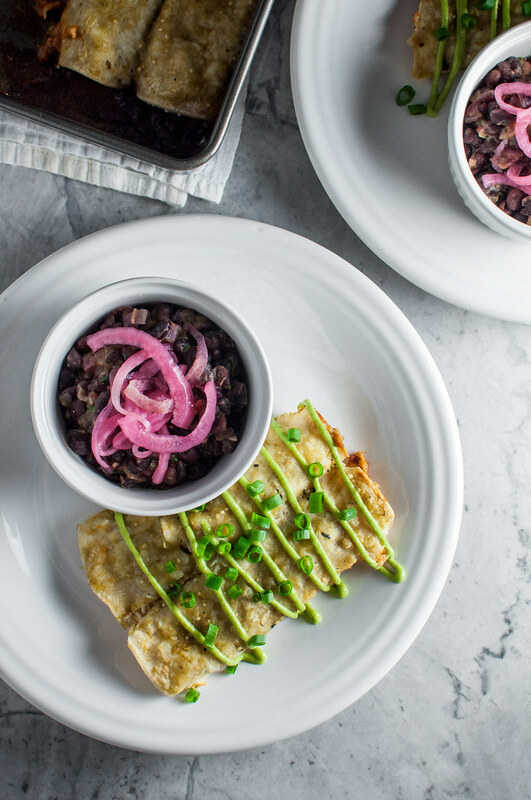 Serve each portion with tangy avocado dip (pictured), guacamole, sour cream, and/or more salsa, plus the green scallion tops. To make the enchiladas vegan, just omit the cheese! And perhaps top them with some vegan sour cream. 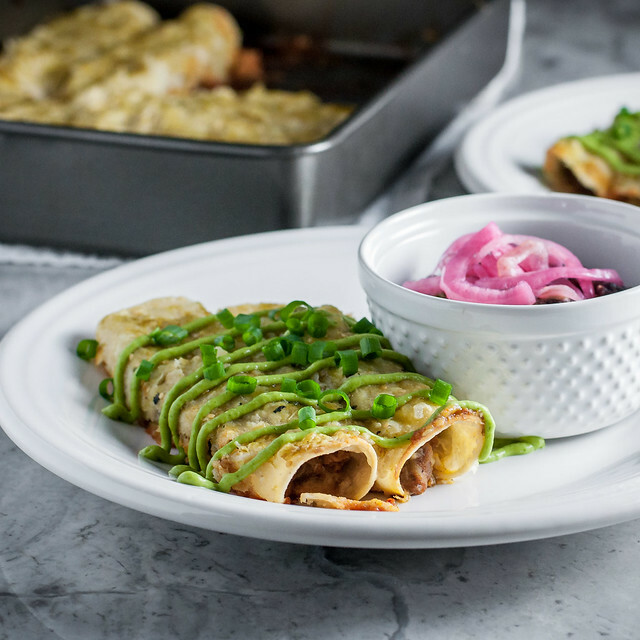 For even easier assembly and serving, make these enchiladas into a pie! Note: This page contains affiliate links. It does NOT contain sponsored content. 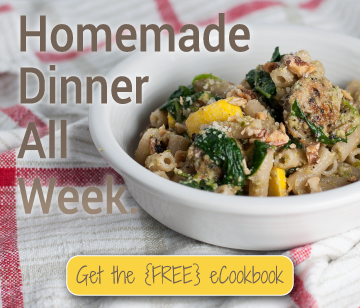 Affiliate links (to products I recommend, on Amazon) offset my ingredient and website maintenance costs, so I can keep bringing you crowd-pleasing recipes like this one. Thanks! I cannot believe that is eggplant! P.S. I’ve been to Duluth Grill before. Very yummy!